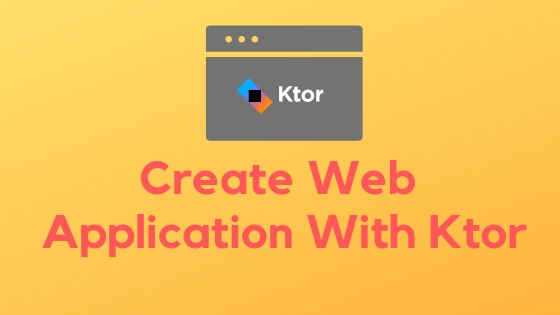 Its easy to develop a web application using Ktor, In this article I am going to explain the tools we need and the steps for developing a small CRUD based web application using Ktor. I will take Employee entity as an example to demonstrate this application. We are going to use below frameworks/libraries. Ktor framework: Develop asynchronous servers and clients. FreeMarker: Template engine to generate text output. We are using it for HTML pages. H2 database: In-memory and very fast database. Exposed SQL library: Light weight library for database access. If you are new to Exposed and Ktor framework then please go through below series of articles. These articles will explain them in more details. We are going to develop web pages using Freemarker and these pages will perform add/edit/delete operations on the employee entity. Lets get started. Go to App.kt and update it with below code. Lambda instance of Application. Right now it is empty but we will add more details to it in next sections. template.ftl: This is the base template of our application. This contains the page layout. index.ftl: Main page with list of all employees and gives options to add/edit/delete employees. employee.ftl: Allows us to add/edit employee. This is a simple HTML page uses Bootstrap CSS for styling and has some FreeMarker directives macro and nested. Macro is used to store reusable templates and we can give it a name to refer them later. In below code I created a macro with named test. This macro contains reusable block, in this case it is having Hello with in p tag. If I want to output Hello then we call this macro <@test/> then the macro will be executed. Below code will output ‘Hello’ two times. Macro can take input parameters and we can use them with in the template. More information on the macro is available on the FreeMarker site. Instead of Macro having its own content we can pass content to it using Nested. Macro acts like a border around the nested. In below example we are passing ‘Hello’ to it and macro will replace <#nested> with the content. In template.ftl we uses macro and nested to define our web page structure. We called our macro as mainLayout now we can use this in other template files. This template is for new/edit employee records. action field in the form is used to maintain the type of action and id contains the employee id which server can use to update it. On submit form will be submitted to /employee. Update App.kt with below code to create HTTP end-points. val action = postParameters["action"] ? : "new"
/: Loads index.ftl by setting all employees in employees key. We use this key in the template to iterate and display all employees in the HTML table. GET: Loads employee.ftl. To handle edit we fetch the employee record and set it in the map. POST: Loads index.ftl after the action. new will create new employee and edit will update the record. Below is the demo run of the application. We developed a simple web application using Ktor framework and used many other libraries to perform CRUD operations on an entity.